BEAUTY AND THE BEAST. (DVD Artwork). ©Disney. 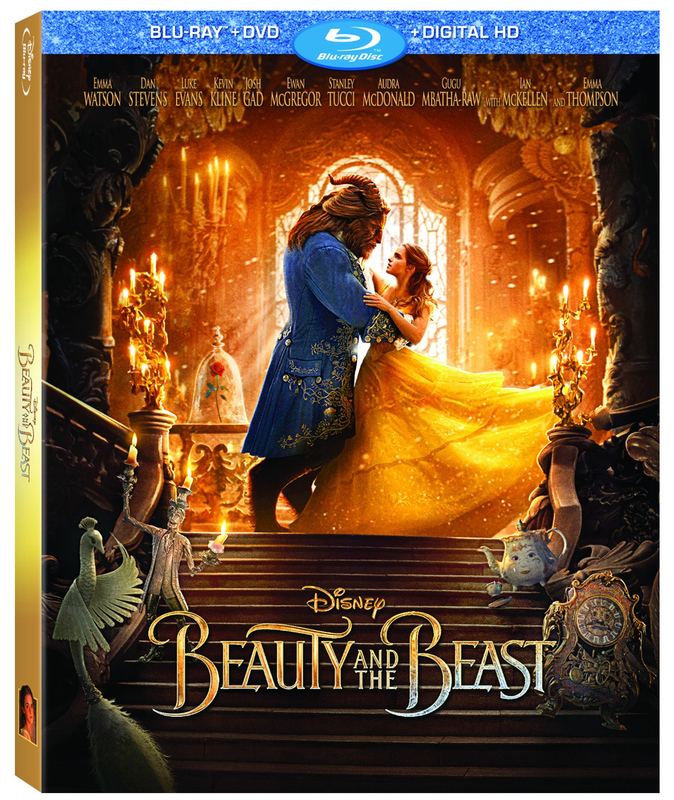 A tale as old as time is at once fresh and familiar thanks to Disney’s remarkable live-action adaptation of the animated classic “Beauty and the Beast,” now available on Blu-ray/DVD Combo Pack with Digital HD from Walt Disney Studios Home Entertainment. 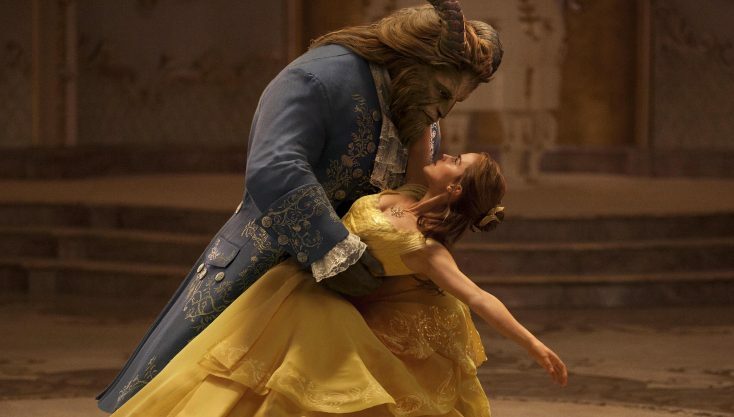 The story of a beautiful young girl who selflessly gives up her freedom to free her father from being held captive in an enchanted castle by a fearsome beast—and slowly starts to see the wayward prince within her captor—“Beauty and the Beast” is often regarded as one of Disney’s most beloved musicals. That rare feature film that’s pretty much perfect (hence its Academy Award nomination for Best Picture—the first ever given to an animated movie), it may be impossible to improve upon the original animated tale, but director Bill Condon’s (“The Twilight Saga: Breaking Dawn—Part 1 and 2,” “Dreamgirls”) live-action adaptation comes pretty darn close. For the most part, the live-action film stays fairly true to the 1991 masterpiece, however, screenwriters Stephen Chbosky (“Rent”) and Evan Spiliotopoulos (“The Huntsman: Winter’s War”) flesh out certain characters and scenarios to give the story a little more depth. LeFou (Josh Gad, “Frozen”) isn’t quite as evil this time around (and, in case you missed the controversy surrounding the movie, there are also ever-so-slight hints that he’s gay), Gaston (Luke Evans, “The Hobbit: The Desolation of Smaug”) is much more dark and twisted, and the Beast (Dan Stevens, “Downton Abbey”) and Belle’s (Emma Watson, the “Harry Potter” films) budding romance doesn’t come across quite as much like a severe case of Stockholm syndrome as it does in the animated feature, thanks to an emotional new backstory in which the two bond over losing their mothers as kids. These additions are seamlessly woven into the familiar fairy tale, which brings to life such dazzling musical numbers as “Be Our Guest,” “Belle,” “Gaston,” “Something There,” “The Mob Song” and, of course, “Beauty and the Beast” with such gorgeous detail, fans can’t help but get teary-eyed as they watch them unfold on their TV screen. Sadly, the same can’t be said for a few of the new musical numbers featured in the film, especially “Days in the Sun” and “Evermore,” which resemble the tone of “Human Again” (the musical number originally cut from the animated feature and later added to the special edition DVD release after its inclusion in the Broadway musical) and “If I Can’t Love Her” (from the Broadway musical) so much that “Beauty and the Beast” fans will wonder why composer Alan Menken (who wrote the score for the animated feature as well as the stage version) didn’t just use those established musical numbers instead. Of course, it’s obvious the new numbers were added in hopes of winning a Best Original Song Oscar nomination at the 2018 Academy Awards, but they’re not as good as the previously recorded numbers Menken wrote. That being said, Céline Dion’s new end credits song, “How Does a Moment Last Forever” (which also briefly appears in the film, just not sung by Dion), is a great addition to the “Beauty and the Beast” music catalog, and it just feels right having the original “Beauty and the Beast” songstress contributing to the live-action soundtrack. With regard to the casting, fans can rest assure that Watson, better known for her acting than singing skills, is delightful as the strong-willed protagonist and her voice actually works quite well for the part. There may be better singers out there, but it’s hard to say whether there’s a better actress to play the iconic role. Gad, Stevens and Evans all shine in their respective parts as well, particularly Evans who is positively a joy to watch as the egotistical Gaston. The rest of the supporting cast, which includes Ewan McGregor (the “Star Wars” prequels) as Lumière, Sir Ian McKellen (“The Lord of the Rings” trilogy) as Cogsworth, Emma Thompson (“Sense and Sensibility”) as Mrs. Potts and Kevin Kline (“A Fish Called Wanda”) as Belle’s father, Maurice, also do a wonderful job, and are given more of a backstory for viewers to enjoy as well. “A Beauty of a Tale” is an extensive look at the making of the film, which quickly address why the filmmakers even decided to do a live-action adaptation to begin with (according to Watson, who loved the animated film since she was 4 years old, it was because there was still so much more to explore and tell). Broken up into several segments, the informative extra covers everything from the “Enchanted Performances” to the special effects needed to pull off the challenging “Be Our Guest” musical number and make the Beast a believable character. Viewers will hear the crew sing director Bill Condon’s praises and talk about how he was perfect for the job being a huge musical theater fan; discover how the entire “Beauty and the Beast” world was basically created at Shepperton Studios in England (minus the forest scenes); see Sir Ian McKellen get the rare opportunity to “tackle something new” with the role of Cogsworth; and hear Josh Gad discuss the challenge of “putting your own stamp” on a part so many people already know and love. “The Women Behind ‘Beauty and the Beast’” takes a look at the many women who worked behind the scenes of the movie, like production designer Sarah Greenwood, costume designer Jacqueline Durran and casting director Lucy Bevan. Introduced by Emma Watson, the inspiring extra encourages viewers at home to follow their dreams by finding something that they love doing and then going out and doing it, with many of the female crew members admitting that they didn’t even realize their particular jobs existed at first. “From Song to Screen: Making the Musical Sequences” focuses on four of the original animated “Beauty and the Beast” musical numbers the live-action film brought to life: “Belle,” “Be Our Guest,” “Gaston” and “Beauty and the Beast.” Featuring interviews with the cast and crew, viewers will hear Watson admit that she had “terrible butterflies” before singing the movie’s beloved opening number, “Belle,” and how filming “Be Our Guest” was “the most boring scene” the actress ever performed in since she literally just sat in a chair and reacted to nothing. Other interesting tidbits audiences will learn during the making-of extra include how the various townspeople in “Belle” eventually play much larger roles at the end of the film; how it took six months to plan the shooting of “Be Our Guest,” one month to actually film the musical number and then 15 months to complete its CGI; how Josh Gad and Luke Evans rehearsed “Gaston” for a month before filming the scene; and how Dan Stevens had to dance in stilts for the “Beauty and the Beast” ballroom number. Several other music-inspired extras are included on the release as well, including an extended version of “Days in the Sun.” Viewers will hear from director Condon how the musical number had to be reshot because test audiences originally confused the Beast’s dying mother with the enchantress who casts a spell on him at the start of the movie since the two actresses looked so much alike. The filmmakers later had to recast the young prince when reshooting the scene, too, because in the version of “Days in the Sun” that ended up in the movie, the young prince starts singing the song instead of his mother and the boy originally cast in the part couldn’t sing. “Making a Moment with Céline Dion” features the legendary performer discussing how she was conflicted on whether or not to record “How Does a Moment Last Forever” following her husband René Angélil’s death last year since he was such a major part of her original “Beauty and the Beast” experience. While it was a difficult decision to make, Dion said she’s ultimately proud of her decision to go ahead and record the song and knows that René’s watching over her and is proud of her choice, too. The music video for Ariana Grande and John Legend’s take on Céline Dion and Peabo Bryson’s original “Beauty and the Beast” single is also included on the disc, which actually features the ponytailed pop star performing the number with her hair down for a change. A quick featurette on the making of the music video is included as well, in which the two singers discuss performing the song for a new generation. Legend notes it was both a “challenge and an honor” for him and Grande to get the opportunity to put their own spin on the classic track. For those who simply want to enjoy their favorite musical numbers from the film over and over again, the Disney Song Selection feature lets guests quickly access their favorite musical scenes with the push of a button or via a Play All option that plays all of the main musical numbers featured in the movie: “Belle,” “How Does a Moment Last Forever” (Music Box), “Belle” (Reprise), “Gaston,” “Be Our Guest,” “Days in the Sun,” “Something There,” “How Does a Moment Last Forever” (Montmartre), “Beauty and the Beast,” “Evermore,” The Mob Song” and “Beauty and the Beast” (Finale). As an added bonus, as each scene plays, the lyrics to the song appear on the bottom of the screen for viewers to sing along to just like in the sing-along version of the film. Wrapping up the extras are eight deleted scenes—“Gaston Courts Belle,” “Bread and Jam for Agathe,” “Storming the Ice Gates,” “Lumière Torches LeFou,” “Monsieur Toilette,” “Cogsworth Rescues Lumière,” “Treacle the Lasses” and “LeFou and Monsieur Toilette Reunite”—which viewers learn from an optional introduction by director Condon were either cut from the film for run time or tonal shifts. Guests can watch each scene individually or via a Play All option. For the most part, each scene runs under a minute in length, with the exception of the humorous “Gaston Courts Belle,” which is more of an extended scene of Gaston going off to save the so-called “damsel in distress” from being harassed by the townspeople while doing some laundry. Most of the deleted scenes take place during the final battle sequence in the Beast’s castle, too, so they don’t really add much to the story, although audiences do get to meet a funny new character, Monsieur Toilette. While many people will argue that Jon Favreau’s recent live-action adaptation of “The Jungle Book” is now the definitive Disney version of the classic tale, the only reason moviegoers won’t consider this live-action adaption of “Beauty and the Beast” the new Disney go-to is because the original movie didn’t have any noticeable flaws. That doesn’t mean this new version of the cherished tale, however, is any less magical than its predecessor. 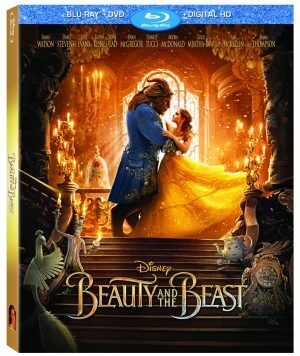 A stunning visual achievement, die-hard fans who were worried that the live-action version of “Beauty and the Beast” would tarnish the original movie in some way have nothing to fret: the film is a modern-day masterpiece well deserving of the Disney name and a place in everyone’s home video collection.